The journey to obtaining a black belt in Tsutsumi Hozan Ryu Jujutsu takes many years of dedication to the art. Emphasis is placed on perfection of technique and attitude rather than the colour of the belt. 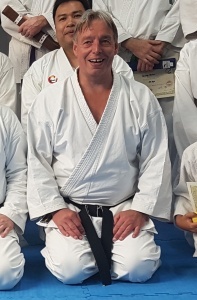 Chief Instructor, Hans de Jong Shihan (8th Dan) has trained in jujutsu for as long as he could walk and like his father before him, Jan de Jong Shihan, continues to teach a practical and balanced martial art centered around the principles of self development and self control. Shihan Hans has successfully taught the art to people from all walks of life – from children through to the elite SAS. Shihan Hans is Principal of Hans De Jong Self Defence School , International Ambassador for the Australian Jujitsu Association and has been Sensei Dan’s teacher for over 30 years. Sensei Dan’s family involvement with Tsutsumi Jujutsu spans 3 generations and started in 1986 where he was introduced to jujutsu at a young age. 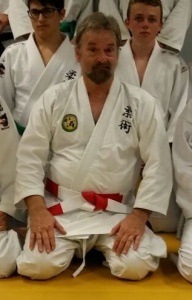 Dan has been teaching Tsutsumi Jujutsu since 1996 and continues to train under Master Hans De Jong. 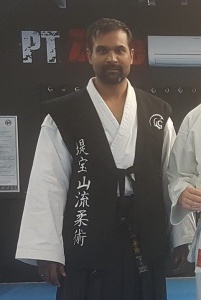 Sensei Dan is graded to 5th dan black belt in Tsutsumi Jujutsu and 1st Dan in Shotokan Karate, holds Cert III in Fitness Instruction and is a Senior First Aider. Dan is the Principal Instructor and owner of Self Defence Central Dojo. Sensei Dan is the THRI (Tsutsumi Hozan Ryu International) Principal, and has developed the grading system framework to coordinate with affiliated clubs and assist the introduction and promotion of Tsutsumi Hozan Ryu Jujutsu. Sensei Craig has been training with the De Jong family since 1986 and has been teaching Tsutsumi Jujutsu for a number of years. Sensei Craig also has a background in the fitness and personal training industry and often draws on his knowledge of bio-mechanics when instructing. Sensei Craig is graded 5th dan black belt and continued to train with Master Hans De Jong. Andre has been training with the De Jong family since 1985. 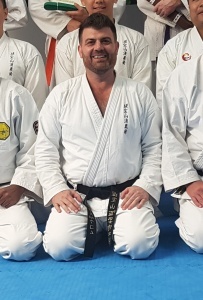 Following a work related assignments in Guam, Melbourne and Adelaide for several years Andre has returned to Perth to continue his training under Master Hans De Jong and is graded 1st Dan black belt. Sensei Andre regularly teaches at Self Defence Central Dojo and provides ongoing guidance to students and assistant Instructors.